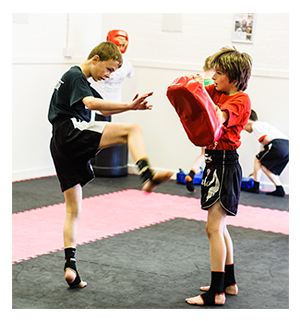 Kids Thai Boxing Your child will benefit in many ways from participating in our ‘Kid’s Thai classes’ which will help them achieve success in everyday life – at school and in play. 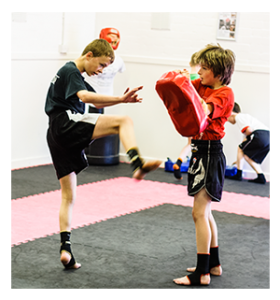 We encourage and promote; confidence, assertiveness, good manners, discipline, learning, motor skills development, martial arts techniques, junior Thai Boxing, fun, structure, positivity, exercise, mobility, flexibility, self defence and so much more. We offer a full grade syllabus to & conform to the Scottish Thai Boxing Association criteria for teaching and grading – the only club that does so in Ayrshire. We hold regular grades for the kid’s and submit photos and stories to the local press so they become little superstars. Kid’s will be aiming to achieve Junior Red Khan /1st Degree (Junior Red which is eq. to a Black Belt 1st Dan), they then move onto the senior syllabus. Your child will rise to the challenge of learning new skills & techniques. Character building exercises will play a key role in molding a positive future for them – which will help them interact with peers easily and avoid bullying issues – kid’s need confidence to deal with bullying issues, if you have a bullying problem call Alan Currie to discuss it, he can help and his direct number is 07885 348652. Meeting new friends in a safe environment is very important to and being prepared for Primary and Secondary School is becoming a priority issue with concerned parents now. a score sheet to show how well they scored and how they could improve on certain elements for next time. the chance of stardom as they feature in the local press ! 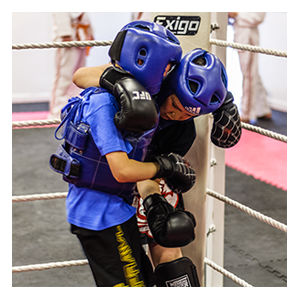 Kid’s Sparring – We offer regular sparring competitions which we call Interclubs, great events and everyone is a winner. We promote a no winner & no loser environment so all kids win and get a medal. 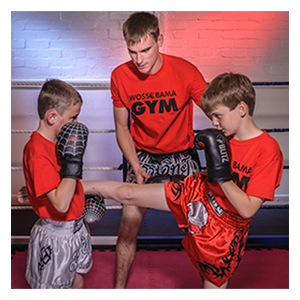 A fantastic confidence booster for any child, each bout is guided by a referee to ensure plenty sparring activity with no injuries. titles now at Scottish, British, K1, European and now world championship level. Ally Smith who is a double World Champion in Muay Thai has trained with Alan Currie since he was a junior. Ally is the manager of the Ayr Wossobama Gym and has followed our training structures for years which is 100% proof our system of training works – GUARANTEED. 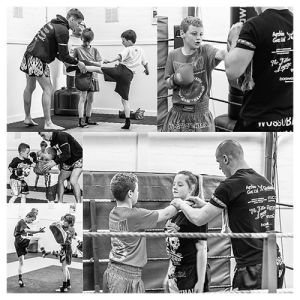 We are the only local club that has direct links to the main organizations in Scotland and the UK for Muay Thai – no other club locally has this recognition.